HOFA has released two new products based on their CD-Burn & DDP software for CD authoring and DDP creation. The new products are called DDP Player and DDP Player Maker. Disc Description Protocol (DDP) is an image file format for specifying the content of optical discs, including CDs and DVDs. DDP is commonly used for the delivery of compact disc premasters for duplication. Most people will not be able to do a lot with a DDP image. Burning such an image to CD or playing it requires specialized software that is often too expensive for that purpose only. Enter HOFA DDP Player, a simple, intuitive and inexpensive solution for everyone. 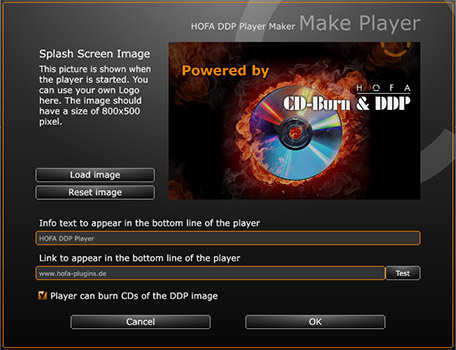 HOFA DDP Player Maker is a great solution to allow your customers to check a final CD Master as a DDP image. You can deliver DDP images to your customers that include a matching standalone player without the need for further downloading, installing or licensing of software. The player works on both Windows PC or Mac OS X, so you can send out one player for both platforms. The created player can be set up with your own logo that will be shown as a splash screen. You can also add custom information text and a link to your website. Furthermore you can decide, if the created player should be able to burn CDs or not. The HOFA DDP Player and HOFA DDP Player Maker are available respectively for the introduction prices of €9,90 and €54,90 in the HOFA Plugins Store.